This entry was posted in Announcements by Sandra Thomas. Bookmark the permalink. I would like to know if I could order 20 lbs of BBQ and have it shipped to me? I’m a alumni of North Mecklenburg HS. Class of ’88. Would you all please ship this? Every where here they have pulled pork… ????????????. I grew up on Mallard Creek BBQ. Please let me know. I wish we could accommodate you, but we’re just not set up for deliveries of any sort. Please try to schedule some vacation time that corresponds with the BBQ… we’d love for you to be able to be here! Do you have BBQ chicken instead of pork? No, we have barbecue chopped pork. The Brunswick stew has pork, beef AND chicken. Hope you can still join us! We officially begin serving at 10am. But we will be ready by 9 or 9:30am. We will continue until the food runs out… Usually the Brunswick stew is the first to go. If you can come early (before 11am) or come 130-230P you can avoid some of the lunch crowd. Is your BBQ safe for those with peanut allergies? We do not use any peanut products, but not being an allergist, cannot be definitive. Is it pork or beef? It is pork barbecue. 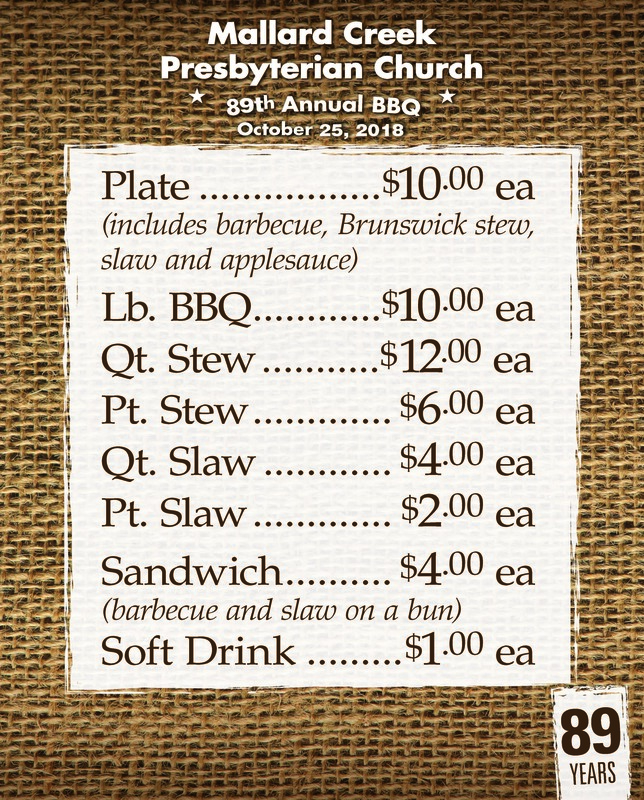 The Brunswick stew includes beef and chicken in addition to the pork (and vegetables!) Yum. Just wanted to say Woo-Hoo! I’m sad you experienced this. We were sold out of barbecue and Brunswick stew by about 4pm, earlier than I ever remember. Please try again next year. Thank you for your support. I was wondering for the Brunswick Stew, is it dairy free? Are there any milk, butter, cheese type ingredients? There is butter in the Brunswick Stew recipe. Thank you for your interest. The barbecue is strictly pork, salt, pepper and vinegar. Do we need to pre-order for 20 plates? It would be best if you call tomorrow morning to place your order. We begin serving about 10am. The sooner you call, and come, the better! Do you guys take debit cards?